...is a fabulous exhibition at the Dean Gallery in Edinburgh that builds on their distinguished collection of surrealist paintings and related works (books, pamphlets, posters) to evoke the origins of surrealism (in Dada), its development and post-war fading and dispersion into influence on other movements. This included an illuminating room of British artists both those who identified with and those influenced by surrealism. Here there were the known and familiar - a Paul Nash, a Cecil Collins, a Graham Sutherland - and (to me at least) the unfamiliar - John Armstrong and a haunting piece by Edith Rimmington called, 'Family Tree'. Edinburgh was the first city I was allowed to roam free in as a teenage visitor and one of the places I came was the National Gallery of Scotland. It was my first gallery and, thus, retains an important place in my affections. 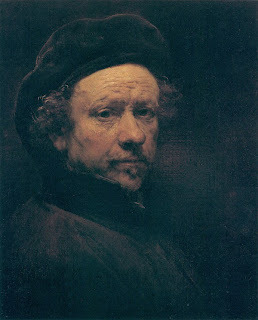 I slipped into it again on Friday afternoon and the highlight this time was the Rembrandt self-portrait shown here. It was painted when he had fallen into social disgrace as a bankrupt and into personal grief as his long standing mistress had died. He looks shorn of status and regard but glimmering through his eyes is defiance and a fierce pride. I remember watching this series many years ago, and am only now reading the book that accompanied it. I remember Pamela Tudor-Craig, whom I subsequently met, as the epitome of English eccentricity: straight back hair, clipped voice, dressed in velvet knickerbockers, imparting diverse knowledge with alacrity! 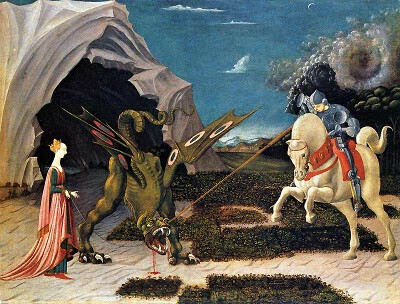 I loved the series - it was my introduction to art: how to look at paintings in depth not simply for their stylistic attributes but for their meaning and for the sense of how they were received by their audience and how they might be received now. Having read only the first two chapters, several things strike the mind. The simple observation about the different context in which the paintings were made for (and they are all from the Renaissance) namely private ownership, intimacy, being lived with and their current circumstance hung in a gallery and how that changes how and what we see. "While not being forthcoming on what action the government proposed to take against the duo, Law Minister Veerappa Moily said their comments were "most unfortunate". While there is freedom of speech, "it can't violate the patriotic sentiments of the people," he said (from a report in The Times of India). As Bill McKibben shows in his latest book, 'Eaarth', all the careful scenarios of forthcoming climate change appear to be arriving ahead of 'schedule' (as if we could imagine that nature might obey our scheduling) and that the stable world we have enjoyed since the last Ice Age is unraveling. Frances Horowitz was a poet of landscape transformed - by myth, by the envisioned accuracy of her seeing, by the incidents of her domesticity. What I love about her is the ability to weave all three into luminous wholes. She died at the early age of 45 but her slim volume of collected poems live and breathe on. I was struck this morning with the recognition that both the conceiver of the Rite of Spring and its composer passed through it (and their attachment to Russian folk tradition) to a wider, deeper placing both of their art and their spirit. 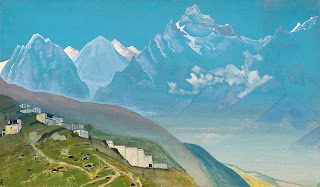 Roerich's journey was an expansive one both literally in its geography (and as an explorer) and metaphysically as his orientation deepened towards the inner harmony betwixt religious expressions. This morning on the way to work I listened to the Rite of Spring and heard it again as I heard it that first time in a music appreciation class when I was seventeen. Up until then music had passed me by neither my father's jazz nor my brother's pop (though I expect he would wish for a more sophisticated labeling) had made any impression on me. This was different from the haunting lyrical opening to the harsh rhythms of dancing into death, I was captured. I bought the record and, when my brother was absent, sat in his room playing it over and over (and if truth be told being lured into dancing it out too). After a week of this obsessional engagement, my father came upstairs handed me a £5 note and told me to buy another record! How is the world changed? The age old tension between outwardly directed social action and internally directed spiritual transformation is the underlying patterning of Lindsay Clarke's new novel. Its central character, Martin, has purposefully become a successful television journalist in order to share with the world it most wounded, conflicted points. In doing so, however, he has become both addicted to the adrenalin of conflict and put aside his youthful sense of the meaning of things, shaped, in long abandoned, poetry. His life has been shaped and merged with the life of a dysfunctional family whose four members have all paid a significant part in his making and unmaking; and, now in midlife, he confronts its three surviving members in search of both their reconciliation and a new strand of life. The man it was rumored now some women had seen tghis morning alive? 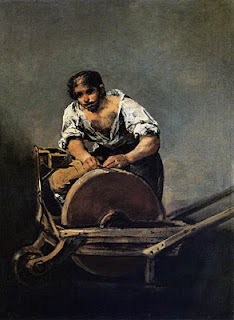 The Servant-Girl at Emmaus (A Painting by Velazquez) by Denise Levertov. Yesterday I went to Jersey to visit donors (including the Jersey government) both to thank them for their generous support and sketch out our future lines of work. It was a cool grey day that did not exhibit Jersey's charms to greatest effect but one of its features was delightful: people's helpfulness. No sooner had you paused, map in hand, looking lost than a 'local' appeared to show you the way, with unflagging courtesy (and 'local' meant here anyone who lived there, often, clearly by accent, not always an indigenous islander). Today, on holiday, I went to see the Gauguin exhibition at the Tate Modern (a gallery, I confess, to cordially loathing) and, amongst the milling crowds, there he was arraigned in a developing glory of colour. It is the Tahitian paintings that hold the popular imagination - voluptuous women, sometimes tinged with androgyny, languidly rest or languidly live or languidly labour! 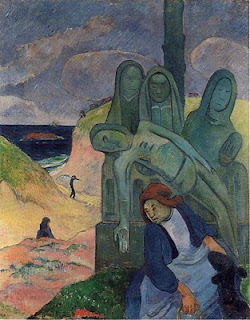 Often in these paintings there is an element to disconcert - death watches over a sleeping woman a raven inspects a lying body and an idol (from Gauguin's reinvention of Tahitian myth) obtrudes into a domestic scene. You are asked to imagine (by the painter) that a complex symbolism is at work but Gauguin's fails to convince as an intellectual painter. 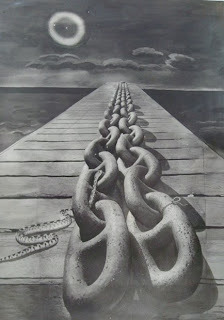 There is something forced, partial and radically incomplete in his vision. In the preface to Kaufmann's translation of Buber's classic, he remarks that "Our first loves leave their marks upon us...Buber taught me that mysticism need not lead us outside the world. Or if mysticism does, by definition, so much the worse for it"
Both resonated: I vividly remember reading I and Thou for the first time sitting in the library at Heythrop, half entranced, half understanding what was being said and the recognition. Here was a description of how to approach the world that made deep sense, that challenged and chastened. It still does. I came away from it convinced that the only God who could be responded to was the God who directed you to finding truth in how you related to the world, not what you believed was critical but who you were and, most especially, how you were. That I fail over and again that challenge of relatedness is clear, that it remains the central challenge is equally clear. One of the stranger aspects of traveling in Albania, making my way down the coast, in the mid-90s, was encountering people who wanted to talk about Norman Wisdom, who died today. This was not immediately explicable: how an English comic actor whose career peaked in the 1960s came to be a talking point amongst Albanians - young and old - in the 90s. It transpired that his films were the only foreign films allowed to be shown in the isolated 'Communist paradise' that was Albania under Enver Hoxha. He was known as 'Pitkin' his principal character, a put upon worker, victimized by his boss, presumably making him a working class hero (though I would have thought that a worker being victimized by his boss would be a good image of Albania under Hoxha). As the Albanian ambassador said today: he gave us something to laugh about when opportunities to do so were severely limited. It has been delightful to watch Phoebe's work grow (as illustrated here) from a 'marginalized' occupational therapist in Bristol designing creative games and tools to enable people with learning disabilities to have greater possibilities to explore the world around them, developing new skills on the way to an acknowledged expert in non-verbal communication, often working with highly disturbed people, whose frustration at not being seen, engaged, boils over in various ways of 'acting out'. It has been a sustained life of attention, creativity, discipline and love. What is it about the sheer accumulation of detail in modern biography, tending to overwhelm interpretation, as it piles up, page on page? It feels like an endurance dance: do you get a prize if you reach the end without skipping? Jonathan Bate is an excellent scholar and lucid writer with excellent critical judgement and his biography of John Clare is many ways wonderful but it left me dissatisfied. Partly this was the wave after wave of detail that never seems to cohere as more than the sum of its parts but mostly because of the lack of exploratory criticism of the work itself either in itself or in its context. Nor was there a sense of speculative entrance into the mind and heart of his subject - this can be risky but is, I feel, ultimately necessary. It is as if a 'necessary' objectivity must stand outside with the details, not crossing into the intimacy of a ventured subjectivity. I dreamt of my father last night. It was one of those dreams that beautifully laid bear one of my many faults for inspection without belabouring or preaching, as dreams do. We were looking together at a map of the Baltic and he was expressing a desire to go there and was naming places on the coast as possibilities. When I expressed obstacles, rather than share in his aspiration, he gently reproved me for this, rightly. I woke aware of how often I default to the barriers in the way (in spite of a usually optimistic nature): a niggling after the negative! 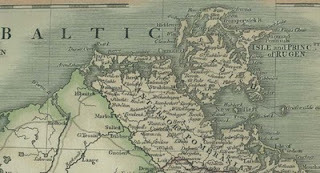 I also pondered the significance of the 'Baltic' realizing that it is where the family name has its origins: in Germany subsequently traveling East (as indeed did our studying of the shared map, eyes passing from left to right). The best argument for the name's origins is for a 'beginning' on Rugen island in the Baltic. You could easily use this delightful exhibition at the Royal Academy as an introduction to Western art (until the First World War). There are notable absences - the Dutch from the sixteenth & seventeenth centuries being the most prominent which given they were struggling for and then affirming their independence from the Hapsburgs (at the core of these Hungarian collectors) this is understandable. There is, also, the absence of the geographical periphery - England, Russia and Scandinavia - but we will forgive them! 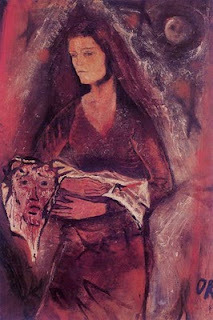 Oskar Kokoschka's 'Veronica with veil' is in London presently (from its home in Budapest) at the Royal Academy. It is hauntingly beautiful - the natural woman, earthed and present, holding the supernatural image of Christ, made as she wiped his stained face as he climbs, with the cross, to Calvary. It is a juxtaposition captured in the painting, the more naturalistic woman, the more symbolic face: the first icon of Christ.